OfficeOne PowerShow registers the license for use on the machine. 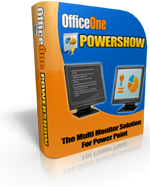 Any user on the machine can use OfficeOne PowerShow after the license is registered with it. Administrator privileges are required for installing the product as well as registering the license. After a license is successfully registered, even guest users can use OfficeOne PowerShow. No further installation is required. Use Volume Licensing to make it easier and more cost-effective to run PowerShow on multiple computers within a single purchasing organization. Use Volume Licensing for 1 year to make it easier and more affordable to run PowerShow on multiple computers within a single purchasing organization. You need to purchase again after the end of the license term. Email officeone@officeoneonline.com with your requirements. Please ensure that your SPAM filters are set to allow email from officeone@officeoneonline.com. Note: Please ensure that you have evaluated the trial edition of PowerShow to your satisfaction before making the purchase. These numbers are for Digital River. Before placing the order, please make sure you know the Product ID (see the table above). Please note that these numbers are for placing orders only.